Went out for a nice 12 miler... and that never happened. First 2 miles felt great despite the oppressive 97% humidity (Its back), then there is was- the sharp quad pain. I can to slow way down and reel it in.... Time for a 3rd opinion. Went to a new doc today. He came highly recommended and has helped people like Arnold S(however you spell his name) when he was on his fitness tours as well as countless runners. Problem? He is expensive. We did some joint adjustments in the pelvic area and lower back. Also used a cool laser (not like neat, actually cool as is cold) on my aductor area as after much prodding and tweaking there was much scar tissue here. 1 Week no running. Bummer. Many treatments coming... says his goal is getting me running in just over a week. I am cautiously optimistic, but he has all kinds of little tools (he says European athletes use, but stateside insurance wont cover of course). Anyway, not real happy, but don't worry about me, go check on Steam! I'm allowed 1 mile on trails or track... Doc is pretty sharp,going back tomorrow..Hope to have a better update. 3rd visit to the doc. I can run two miles and bring it up from here. As long as I keep it slow until next wed. After many adjustments, workouts, stretches, cool laser treatments, x-rays and overall poking he is convinced that the nerve area is no longer a problem (at least not much of one). The remaining injury is the pectineus muscle and still adductor area. So far treatment has been good, but without pushing the miles or speed I am unsure of total progress. The cause? Always a mystery but during all the testing he was very surprised/impressed how strong my muscle areas were for having that much pain manifest itself in the quad area... until... my hamstrings. He told me my flexibility in my hamstrings were like a 90 year old man. He asked me what I was doing to correct this... and well... hey are we suppose to stretch those?? He thinks this has thrown my running form off and bunch of other big terms causing the injury. For the past week I have been learning how to really stretch that area and wow am I tight there. This will be a daily stretching routine as I get my miles back. I am not bothered too much since I do not have have a focus race until fall. I wanted to set some June 5k/10k PR's , but that will have to wait. I just want to run without discomfort and then really push myself to my limits. 2 Miles, I figure if I have to watch my speed and slowly add miles I may as well do hills and the toughest short trail around me. Hilly trail miles, little rain. Trail miles... probably faster than my doc wants. Couldn't help it, felt very good to run today, I wanted to keep running. Worked on lifting the knees more while running. More fun trails, warm, but don't really notice on these short runs. Feels really good right now, doc in the am so I'm hoping for a clean-er bill of health and some more running. Doc visit today. Had me all over the place stretching and working out. Put me on TM and I had my phone in my pocket. So I hit start and then stop, but hopped off it to empty my pockets. He said "you didn't just do that right in front of me??" He told me to stop doing things like that or I would aggravate my injury. So I ran on the TM for just under 10 mins... it was funny... he said "you make that look so easy". 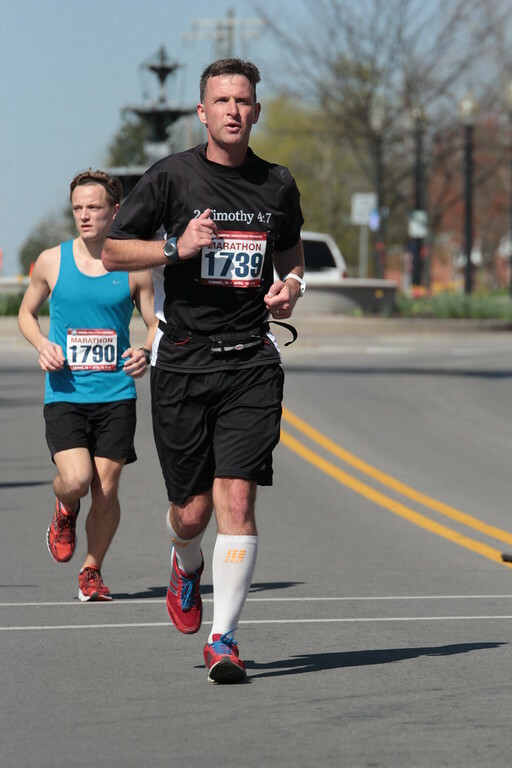 Here I am just trying to land on my forefoot and keep my knees up. Anyway, after a long visit, he will see me again a week from Friday but gave me the green light to move up to 5 mile runs and even add a little speed in later :) Happy news for me! He said if Friday goes well I can move up to 10 miles. I am hoping!! Taylorsville trails and then some bike path. Very nice morning to run. There is mental aspect of increasing mileage that triggers in me. Hard to explain. When I cant run at all, and then can run even just a few miles it is frustrating yet nice to be able to just run- even if a little. Then getting to bump that up does something mentally that I like.... so I'm mental. I was going to run early, but I ended up staying up way to late with our church have a set of revival meetings and getting ready for my Sunday lesson. I knew it was going to get warm later, but I figured it was only 5 miles so I will just run in the afternoon. Ran down to the local high school track (about a mile) and wanted to get a little track work in. The doc said I could do a little speed work and he stressed that, leaving me the famous works of 'don't be a knuckle head' (and Kelli and Preston reminded me of that very same thing). SO what is safe? I figured just 4x400 repeats with 200 jogs would be fair enough. I knew I didn't want to go all out, but maybe just below 5k pace since I am sure my fitness is not where it was or I want it. Ok it was hot- 88 degrees and humid. Blah, and on the track I could feel the heat on my feet through my shoes. Splits 1:28, 1:29, 1:30, 1:30 and I am sure I could have thrown a few more in, however, mission accomplished and I feel for the most part fine. I really want that feeling to stay the same. Early slow running. Legs were tired, but I think all of me was tired. I woke up at mile 4. Today... Hot... 80s... I had my mini track workout this week so it was time for my mini tempo run. 7:45ap, 7:17, 6:54 tempo paces. the heat made it feel like more, but I'm on the 5 limit still. Doc in the am... Will see if I get cleared for more. Saw the doc today. Good visit, he figures I'm about 75% healed and has cleared more miles and a little more speed work after watching me on the treadmill. He said I was striking front to mid foot on the tm, but I had the pace up (6:43) so I am not sure about my regular runs. Good overall workout with the doc and cold laser treatment. Still has me on a basketball ban. Taylorsville park, early, warm and humid 70/96% Half trails/half pike bath- it was baby animal day with a baby possum on the back of momma and later baby deer with a few bigger ones out and about. Overall run was fine, slowly increasing mileage at an easy pace per the doc. After the run by the car, it would have been nice to have a picture as steam/mist was rolling off my body and clothes. Its one of those things that if you saw it in a movie or a poster you would have thought it was Photoshopped. Why do I get the feeling it is going to be one hot, humid summer? As long as I can feel alright, I won't complain so call me out if I do! Another Sunday where I did not get up early... sooner or later I will have to learn this lesson. Hot, 94 and steamy. Did the half trail and half bike path again. My oldest daughter graduated yesterday. I had trouble when the video of the old pictures went by. I am very proud of her and she is a GREAT kid. adult. Kid. Yes kid. We have a wonderful relationship and never suffered any of the 'teen' issues most people complain about. I believe this is because of the relationship with God she has and partly the home school development. There were 37 home school kids at the graduation ceremony, it was quite moving. These are the most outgoing kids you will see... so much for stereotypes. So yeah, I spent my run in the heat, sweating... yet just lost in thought... it was good. Took advantage of the schools being closed and ran up to the high school track. Warm 73/73 & sticky. Still limited in what I am green lighted to do for speed work, so trying to make the most out of it. 1.25 WU followed by 6x400m intervals w/200m slow recoveries. 1:27, 1:31, 1:29, 1:28, 1:32, 1:29 I was distracted on the 5th interval by some kids hitting on the glass at the stadium. Slow run back home, had to peel the shirt off. 75 degrees & 100% humidity oh you know I loved waking up to that... Half trail/Half bike path, sticky- slow run, kept focusing on form. It rained about 15 minutes after my run and cooled it off... figures, but hey heat training is support to pay off more. Spending part of the evening trying to help my daughter on an expensive DSLR purchase. It's her post graduation/pre-college desire. She has to help in taking wedding photos this fall so she is all in right now. Trails, but a much nicer morning to run. 63 degrees 73% - huge improvement over yesterday. Relaxed run, no watch. Another nice to run. Of course still under restrictions so the plan was a 'lite' tempo. I figured 2 sub 10k in between 2 mp miles. Didn't go exactly as planned as the first mile I felt totally out of sync, so I cut one of the miles slower to get going. 8 overall, 3 tempo 7:28, 6:38, 6:45, some low 8 for cool down. a few deer on the path for viewing pleasure.